POR FIN Dogmans Beach makes it easy to please your large group. With a private pool, and one of the best surf breaks right in your own backyard, you may never want to leave! Especially at sunset!! Our villa is surrounded by almost an acre of tropically landscaped gardens which makes a natural setting for your family gatherings, and DESTINATION WEDDINGS. There are 5 bedrooms, 3 full baths, 1 half bath, and each room that does not have a private bath, has a vanity sink and mirror. These accommodations are all on the 1st level of the villa, and can accommodate from 10-14 guests. Rate is for 10 guests in high season and for holidays. Additional charges will apply for over 10 guests. In summer months, it is required that you rent the 6th bedrooms when you have more than 10 guests. Steve and I live on the 2nd level of the house in the winter months. The villa is a private villa in the summer months but the property manager is just a phone call away. The house can accommodate 10-16 guests in summer months with a 6th bedroom/studio apartment on the 2nd level of the house. Although we had no major damage from the hurricane, we used the down time to improve the villa with an awesome NEW COVERED LANAI. One of our LOCAL TALENTS built us a dining table made from eucalyptus trees lost in the storm. The farm table is 12 feet long and can seat 12 to 14 comfortably for outdoor dining with a breathtaking view. We also upgraded the pool patio with Coralina mosaic tiles which look “cool” and remains cool and comfortable throughout the sunny day. Furnished with Lounge chairs for 6-9 guests, umbrella covered patio tables, and seating close to the ocean, everyone will surely find a comfortable spot to relax on this new pool patio. We also made some nice upgrades to the kitchen. Brand new custom wood cabinets, made by the same local carpenter were added, as well as a dishwasher. The French doors in the dining and living room open up to the covered lanai and pool patio which makes for a smooth indoor outdoor flow with a feng shui feel. Great surf break!! : Dogmans beach is a surf break between Maria's beach and Tres Palmas. All three beaches are within walking distance from each other. Even if you don't participate, just sitting on the beach and watching them ride the waves is exciting. All beaches are open to the public in Puerto Rico, but, this stretch of beach is as close to 'Private' beach as you can get. Especailly when the water is calm. Walk to Calypso Bar and Grill from the house for sunset happy hour coctails. Walk to the Lighthouse park to watch the whales [seasonal] or just take in the breathtaking views. Destination Wedding at Casa Por fin dogmans: Casa Por fin dogmans beach welcomes you and your guests for weddings, family re-unions, and other get togethers. Up to 100 guests are welcome. Additional charges apply for functions that include guests other than those staying at Por fin dogmans beach. Off street parking is provide for all your guests on a fenced in adjacent lot. We can put you in touch with wedding planners who can arrange details of the entire wedding, or we can share information for party rental companies and caterers who can supply all your needs for a perfect event. We are located within walking distance to some of the most luxurious destination wedding villas in Rincon but yet HALF THE PRICE, making Por fin dogmans beach an affordable alternative for your destination wedding or a perfect place for your extended family and friends, should you choose one of those awesome villas. A short walk to Maria's beach to the right and Tres Palmas beach to the left. An on site manager or Steve and I either live at the house or are just a phone call away should you need anything. We welcome you to share our piece of paradise! Please call or write for availability as we do not use the online calendar. Available upon request for your convinience: Following Items available upon request. Hairdryer,, books, maps, local brochures, pack and play, pool toys, coolers, playing cards and some games. Baby sitters, housekeeping services, personal chef, photographers for family photos, masseuse, and surf board rental and or lessons. We can suggest some PERSONAL CHEFs who will come to the house to cook for your group. Email me for details so I can give you contact information for them. Anna and Steve, or our on site property managers, will be glad to help you with these services. My husband and I first came to Rincon in 1994. We were blessed in 1999 when we found this beachfront home, and immediately knew it was for us. We have done extensive remodeling to the villa and the grounds . We moved here in 2001 and spend most of the fall and winter here. We return to NJ for the summer months. We love sharing the villa and meeting guests from around the world. This property is UNIQUE. The 3 most important things to consider when choosing a home away from home is LOCATION, LOCATION, AND LOCATION. POR FIN DOGMANS BEACHFRONT location is in my opinion, the BEST area I n Rincon. It is on a semi private road, between Steps beach and the light house. 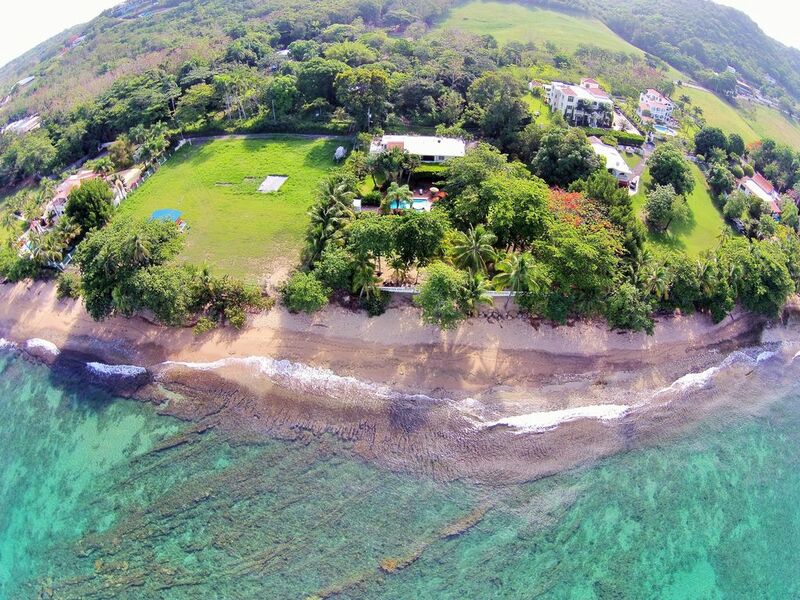 It is rare to find beachfront homes with nearly an acre of property surrounding it. We are in a nice quiet area with upscale homes. House faces west for spectacular sunsets. Conveniently located 2 miles from the center of town for shopping, many new restaurants and pubs, and the Sunday FARMERS MARKET and Thursday evening ART WALK. Short walk to the right on the wide beach will lead you to Calypso Bar and Grill, El Bohio beach bar, and the Lighthouse park. Continue walking and you will be at Domes beach where locals love to surf. There is a small walking path past Domes beach that is worth the walk. The View from this cliffside path is spectacular!!! This is a natural path so it may be muddy after the rain. Walk to the left on the beach and you will come to Steps beach. Good snorkeling close to shore. Next stop, the marina area where there is a nice sandy bottom place to swim. Great restaurants like Shipwreck, Copa Llena, and beach bars are in this area. La Ancla beachfront bar, and a new place at Club Nautico are fun places to have lunch and cocktails. The Unique benefits of this villa 1st and foremost is that it is BEACHFRONT!!! True beachfront. The beaches in the area thankfully are still WIDE BEACHES. You can take long walks on the beach in both directions. Walk as far as the marina to the left, go up and around Copa llena and you can walk past the public beach and beyond. To the right, you can walk as far as Calypso bar, go up and around, and walk to the lighthouse park and a beautiful walking path along the old railroad cliff with spectacular views of the coast along the way. We are close to center of town and the night life bar scene in Puntas, but yet QUIET when you want to escape and relax in your home away from home. Spacious tropically landscaped grounds, semi private road. View of Desecheo and Sunsets from the yard all year long. Short drive or nice walk to town where on Thursday evenings, the local artisans gather to display their art work and share their music. The local Farmers Market is set up in the square on Sunday mornings and is a fun place to visit. The main bathroom is in the hall. Tile from ceiling to floor. There is a full bathroom in Quarto Maria with ceiling to floor tile. Full bathroom in Quarto Chardon Toilet and Sink [1/2 bath] in Quarto Verde We added a very convenient additon to the 2 rooms without a full bathroom. Quarto Rosa and Quarto Azule each have their own VANITY SINK AND MIRROR to illiminate long waits for the bathrooms. Mi Mas Suite, the 6th bedroom with a full bathroom is on the 2nd level of the house, it is available mostly in the summer months. Bathroom has ceiling to floor tile. The ocean is right in the back yard!!! The beach is wide enough for chairs etc. Natural beach with shade trees. You can walk on the beach to the right and reach the lighthouse. To the left as far as marina beach, and to public beach. Por fin dogmans RIGHT ON THE BEACH. It is at the end of Tres palmas marine reserve. It is a great surfing beach in season and great for snorkeling when water is calm. Ocean view from the back covered lanai. View of Desecheo Island and spectacular sunsets. Por fin dogmans beach is OCEANFRONT as seen in the areal photos. Beautiful view of the ocean and sunset, and Desecheo Island right from the back yard. Whale watch in season, right from the property wall. One acre of WATERFRONT PROPERTY. Good cell phone service for all major carriers. We provide all sheets and towels. Bring your own beach towels. Cloths dryer is provided but please conserve energy. Off street parking on property for 3 cars. Additional parking available for approved functions. Leather couch, love seat and chair. French doors open to patio. TV. Ceiling fans. Drip coffee pot AND an electric percolator. Only small amounts of seasonings are provided. New cabinets and granite counter tops and a dishwasher has been add Seating for 12 inside. New covered patio has a 12ft. Long dining table that will seat up to 14. Dining with a spectacular View!!! Indoor dining seating for 8 at a large table. 4 more at the counter. Seating for 12-14 at the outside farmers table under the covered patio for al fresco dining with a view!!! Well maintained tropical landscaped grounds. Nice wide beach where you can walk to the marina area to the left, and to the lighthouse to the right. Taino Divers located at marina. Dive or snorkel trips to Desecheo Island La Parguera, great day trip. Rent small boats. Puerto Real. Ask for info on charter boat in Boqueron beach area. Covered patio off the back of the house provides shaded area for outdoor dining and lounging. A large patio area for grilling. Small covered patio by the pool house. Just Ski rental near Harbor Restaurant. Surf board rental and lessons across the street on 413. Desecheo Dive shop. Dive and snorkel Equiptment rental close by. Tennis courts near the stadium on 115. 17. Miles to the golf course in Aguadilla. Reasonably close, approximately 25 miles to Golf course in Cabo Rojo. The 1st level has 3 small steps. 2nd level to the studio room which is available in summer is up a ramp. Full size private pool with kiddie pool. You are welcome to smoke outside. Only start up supply of paper towels toilet paper and soap provided. Washer and dryer on premises Bath towels are provided but Bring Your Own Beach Towels. We do have a few if you should be missing some. Pack and play available on request Bring along your own music. IPOD & dock, CD player . We do have DVD player. Books, maps, and local activities brochures upon request On site property manager in winter months. Property manager just a phone call away May - Sept. Steve and I live on the 2nd level of the villa in winter months . Out door GAS OR CHARCOAL grill. Large refrigerator with ice maker Destination weddings welcome! Up to 100 guests with off street parking available. Additional ground use fees apply for functions. Write or call for details. Search for casadeplayaporfin on web for more wedding photos. Had a fantastic time in At Por Fin Dog . The pool the yard and the sunsets were astounding. Vinny Beverly and the whole gang we just loved having you!!! Come back soon!!! Beautiful home and surrounding grounds! Loved our stay, the house was perfect for a relaxing get away. Very close to some cool bars/restaurants and beautiful beaches! Owners were very accomadating. They were actually visiting themselves staying in tbe upstairs unit. We got a little rowdy staying up late, yet they were not bothered in the least. Cant wait to stay there again! We stayed for a week. The house was fantastic. The beach was very rocky but you could walk to other beaches near by. It’s about a 10 minute walk to steps beach. The pool was fantastic. Anna was very quick to answer any questions we had. The property is very quiet but close the the town which had several great restaurants. The plaza in town had a lot going on which was a lot of fun. There is a cat that lives at the property and the kids loved hanging out with him. I would totally recommend this property. We loved the outdoor area which is where we spent most of our time. We had 13 people in our group and there was plenty of space for everyone. We did rent the upstairs apartment which was a little smaller than we expected but it was fine. Orange 🍊 the 🐈 says come back soon!!! Beautiful house steps from the beach! Awesome snorkeling right out front of the house. Having a pool to relax was an added bonus!! We will be back! We are located on the western most tip of the beautiful island of Puerto Rico, in the surfing town of Rincon. It is a unique location since we have waves from the Atlantic which are great for surf, while just a mile or so to the south is the start of the pristine waters of the Caribbean Sea. Por fin Dogmans is right next to the marine reserve. Here you can snorkeling with sea turtles and other marine life right off shore. The location is mapped out on google earth. Just enter 'Por Fin Dogmans beach' in the search box. For address, use Pso Bachon Velazquez. Some interesting day trips are to La Parquera and the Phosphoresant Bay, the telescope in Aricibo, The Camuy caves, and of course the panoramic views from the winding mountain roads. Zip Lining is close by. Within walking distance, on the beach, to Calypso Bar and Grill , Maria's beach, and the Light house. ON LINE CALENDAR IS NOT USED SO PLEASE EMAIL FOR AVAILABLE DATES. New photos will be posted very soon. The beach is the same as always and has not been changed by the hurricane. Still a nice wide tree lined beach. We have made major improvements to the house and are posting photos as we go. Photos are current at this time. SPECIAL RATES ARE FOR REMAINING WEEKS AVAIALBLE. Rate is for 10 guests/ 5 bedrooms. House can sleep up to 16 guests when 6th bedroom is available [mostly in the summer months] with additional fees. Add $25 per night for each additional guest after 10 guests. Rental of the 6th bedroom is required in the summer for more than 10 guests. Email me for rates for the 6th bedroom. Payments on VRBO and homeaway will be made by credit card. Administration fees cover the credit card costs. Rate is for 7 night stay, 10 people. House can sleep up to 14. Add $100 per each additional person per week. This is for 5 bedrooms. Minimum stay is 7 nights on the site. Email me for shorter stays in off season months. 50% deposit will hold the dates with balance due 4 weeks before your trip. Money fully refundable up to 60 days before trip. My calendars are mostly up to date but Email me to verify before booking. HOLIDAY RATES MAY BE HIGHER .